Let’s be real, twin turbos are overrated and mainstream. If you really want to make some more horsepower, what you need is a set of twin turdos. The guys over at The Hoonigans, a YouTube channel in which grown men play with cars professionally (it’s sounds like a dream, we know), recently came up with a DIY turbocharged system that they have hilariously dubbed ‘twin turdos’. The turdos, which were installed on a 1984 Pontiac Firebird, appear to be made out of some scrap metal, a pair of fans and a pair of tiny electric motors to power the fans. The turdos work just like normal turbochargers, pulling in outside air, compressing it using a pair of turbine wheels (or fan blades in this case) and forcing the additional air into the combustion chamber. Forcing might be a bit of an exaggeration, though – the turdos produce air pressure that is akin to someone lightly blowing on you. A dyno test conducted by The Hoonigans revealed a power increase of around 30 hp, but that seems a bit generous for the turdos. If you’re wondering, the turdos were constructed from parts The Hoonigans found at a local hardware store. We’ve been poking fun at the turdos, but to be honest, they appear to at least be well made. Or as well made as homemade, hardware store turbochargers can get, anyway. And the turdos didn’t stand much of a chance of working from the beginning, having been installed on a ratty, barely running Firebird that sounds like it’s on its last legs. 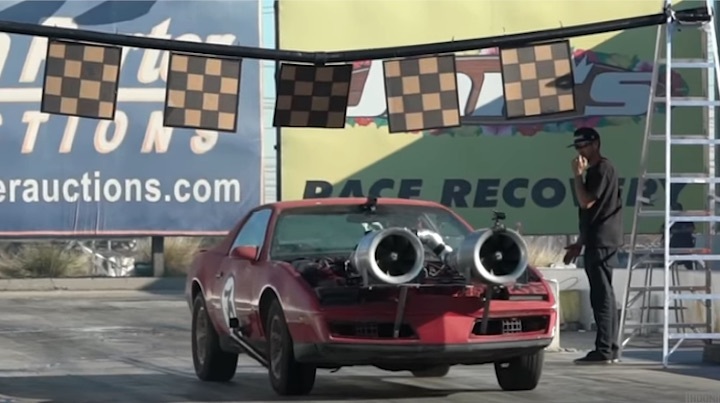 The Hoonigans didn’t just dyno their turdocharged Pontiac- they also tested it at the drag strip at Irwindale Speedway. We won’t ruin the whole turdo test for you, so be sure to see how they perform in the video embedded above. It looks like an obnoxious pair of binoculars. Whatever the horsepower increase, it’s not worth it. Those look absolutely ridiculous. May someone take pity upon that poor car and remove that monstrosity. Ugly as F_ck and wouldn’t own it. I guess some people don’ get a joke when they see one. Absolutely hilarious. If you really look at the numbers before and after “Turdos”, a 40% plus increase in horsepower is pretty impressive. I would not be surprised to see a version of this set up to be seen on the roads of Los Angeles in the very near future.